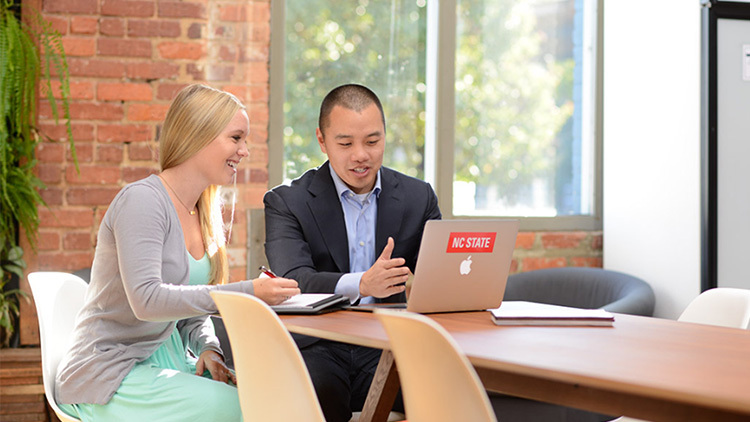 NC State’s Jenkins Professional Online MBA program in the Poole College of Management is No. 18 among the top 20 programs worldwide, according to the Financial Times’ 2017 ranking of global online MBA programs. NC State placed 11th among U.S.-based institutions and was the only N.C.-based MBA program listed in the ranking. This is the first year NC State’s program was eligible for the ranking. No. 8 Career Service rank, defined as effectiveness of the school’s career service in terms of career counseling, personal development, networking events, and recruitment, as rated by their alumni. No. 9 Career Progress rank, defined as progression in the alumni’s level of seniority and the size of company they now work for, versus three years ago on graduation. No. 10 Online Interaction rank, defined as the extent to which alumni rate the interaction between students, teamwork and the availability of faculty. In addition, NC State was ranked the 12th best Value for Money, with the ability for students to complete the degree for less than $50,000 and an average salary increase of 21 percent three years following graduation. “This recognition of our Jenkins MBA program as one of the top online MBA programs worldwide reflects the NC State Poole College of Management’s commitment to excellence and innovative programming,” said Annette L. Ranft, dean and Stephen P. Zelnak Jr. chair of NC State’s Poole College of Management. “Over the past two years, we have improved the program through the introduction of our Customized MBA option, which allows online students to seamlessly enroll in face-to-face courses, and we implemented a major MBA curriculum redesign emphasizing experiential learning and leadership development for our online students. During this time, we have also seen our number of completed applications increase by 99 percent,” said Steve Allen, associate dean for graduate programs and research at the Poole College of Management. This is the fourth year that Financial Times has ranked online MBA programs, publishing the top 20 programs worldwide. To be included, a business school must have accreditation from AACSB and/or EQUIS and have run online programs for at least four years. Although flexible/hybrid MBA programs are included in the ranking, at least 70 percent of an MBA’s curriculum must be delivered online to be considered. The ranking was based on data provided to Financial Times by alumni of the MBA programs being ranked and by the MBA program staff. The alumni survey accounted for 65 percent of the ranking. The most important criteria included salary today, which accounts for 20 percent of a school’s ranking; salary increase since graduation (10 percent); online interaction (10 percent); and FT research rank (10 percent), which is calculated according to the number of articles published by each school’s full-time faculty. Full details about the FT 2017 Online MBA Program ranking and methodology can be found on the FT website. The NC State Jenkins Professional Online MBA is ranked No. 9 by The Princeton Review and No. 18 ranking by US News & World Report. More rankings. The NC State Jenkins MBA is available in three formats: full-time, professional evening and professional online, with a customized MBA option to fit the varied needs of the working professional. Applications are being accepted for the Fall 2017 entering classes. For more information, visit http://www.mba.ncsu.edu. The NC State University Poole College of Management focuses on management education for a technology-driven global marketplace. The college offers undergraduate and graduate degrees in accounting, business administration and economics, as well as custom and open enrollment executive education programs delivered by NC State Executive Education, LLP, based in Poole College of Management.